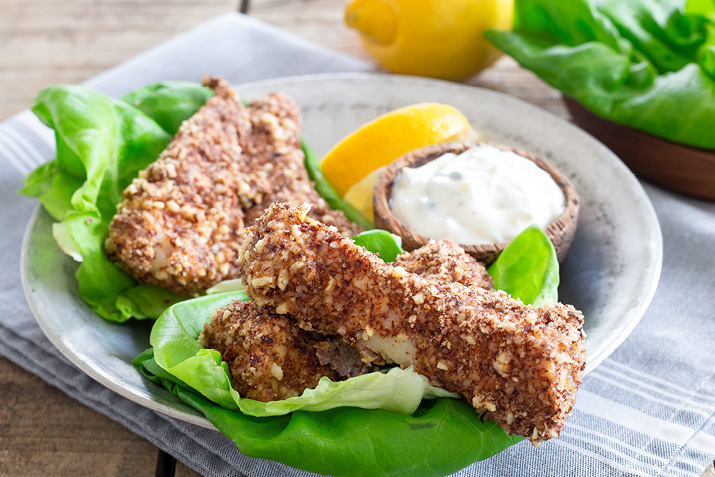 Crispy fish sticks get a delicious makeover in this baked, gluten-free version featuring almond “breading” and yogurt-mayo tartar sauce. Combine yogurt, mayonnaise, capers, pickle relish, lemon juice, salt and pepper in a small bowl; set aside. Heat the oven to 425°F. Lightly oil a sheet pan and reserve. In a food processor, pulse the almonds until they are ground to the size of coarse breadcrumbs. Transfer to a medium bowl and stir in the paprika and salt. In another medium bowl, whisk the eggs and Dijon mustard. Divide the fish fillets into pieces about an inch wide and 4 to 6 inches long. Dip the fish into the egg mixture, then the almond mixture and place on the oiled pan. If there is any almond mixture left over pat it on top of the fish to fill in any gaps. Bake for 10 minutes, then check to see if a piece of fish will flake when pierced with the tip of a paring knife. When the fish is cooked through, cool on a rack. Serve the fish on a bun or in a lettuce leaf, with the tartar sauce. Serve these tasty fish sticks with a side of crunchy coleslaw, or a scoop of Waldorf salad, also made with Greek yogurt.